Located in the south of Japan, the country formally called the Kingdom of the Ryuku’s and now known as Okinawa Prefecture, was the birth place of Karate. There were two occasions in Ryukyuan history when weapons were banned, the first was over five hundred years ago, and the second two hundred years later. In 1609 when the Island was invaded by the Shimazuz and weapons were banned by the new government, the practise of weaponless combat methods received tremendous impetus and the result of this, was the Okinawan martial art of Karate as we know it today was developed. In Okinawa the term of the fighting system was Okinawa-te, (Okinawa hand). It was an Okinawan school teacher named Gichin Funakoshi, who officially brought this fighting system to Tokyo Japan in May 1922, that the term Karate-Do was used. Shotokan Karate was introduced to Japan in 1922. In 1955 the Japan Karate Association was formed and sponsored by the Japanese Government. 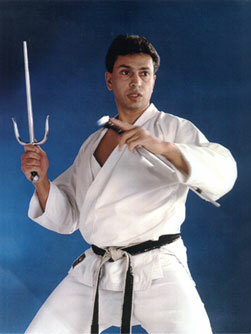 Shotokan is a dynamic form of karate characterised by its deep stances and powerful extended movements. The style uses considerable muscle power in the delivery of its techniques, whether they are blocks or attacks. During training attacks are practised, striking to the various vital parts of the body using full power and speed, yet with perfect control, such that no contact is ever made.